Ski’s Open Heart Foundation was created by the surviving wife, Debra, and children, Crystal and Sean, of Mark “Ski” Gajewski to honor his memory and continue his legacy. This organization was founded to aid the heroes of 9-11 who selflessly helped rescue Americans on that day, recovered bodies of loved ones, and worked at a hazardous site for months to clean-up after the attack. Many put their country first, but later became ill and did not have the insurance coverage needed to satisfy increasing medical bills as well as dealing with lost wages from time taken off from work. Over a decade later, there are still heroes and their families who are unable to afford basic essentials, such as food, shelter and clothing. The Foundation also concentrates on continuing the benevolent work of the its inspiration, Mark W. Gajewski, by working with children charities, animals, and simply lending a helping hand wherever possible. Helping people is a small gesture that everyone can do. Mark Gajewski was one of those heroes. He was one of the first responders on site after the attack at Ground Zero. 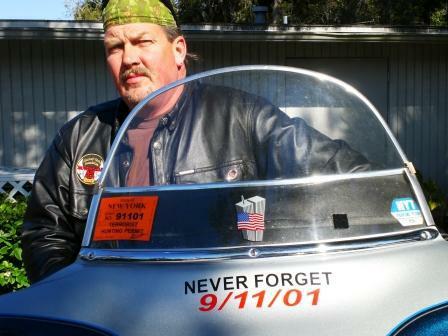 “Ski”, as he was lovingly called, was a former Marine and an Operating Engineer for Local 30. He also managed his own emergency repair service, where he continued his trade as a welder. On Septemeber 11th, he brought his skills and equipment to the site, which many of the responders often borrowed during the clean up. Ski put the needs of his country ahead of everything at that time, spending three full months at Ground Zero without coming home. He was on site until the last day of clean-up for a total of 2,900 hours. Ski experienced things that even his military training could not have prepared him for. For ten years, the World Trade Center Monitoring Program took care of all medical needs, but his eligibility for coverage ended when he was diagnosed with a rare form of Lung Cancer, affecting a very small number of people. The foundation is named Ski’s Open Heart Foundation because this is how Mark lived his life. If you have an open heart, you will always come out on top.